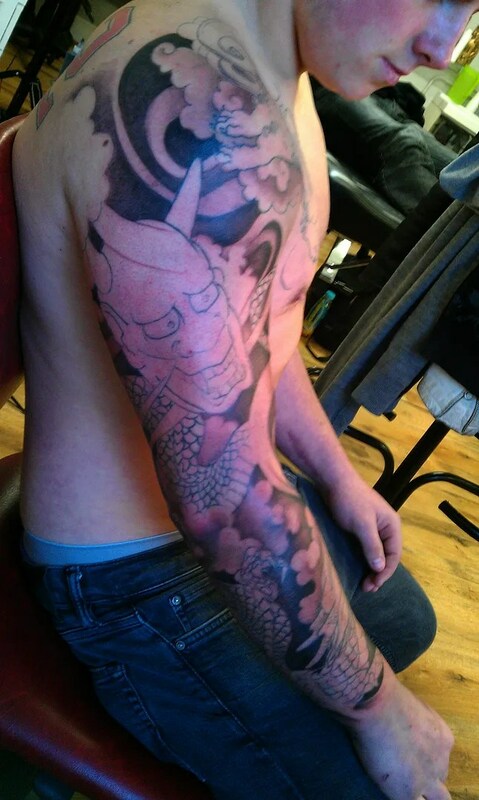 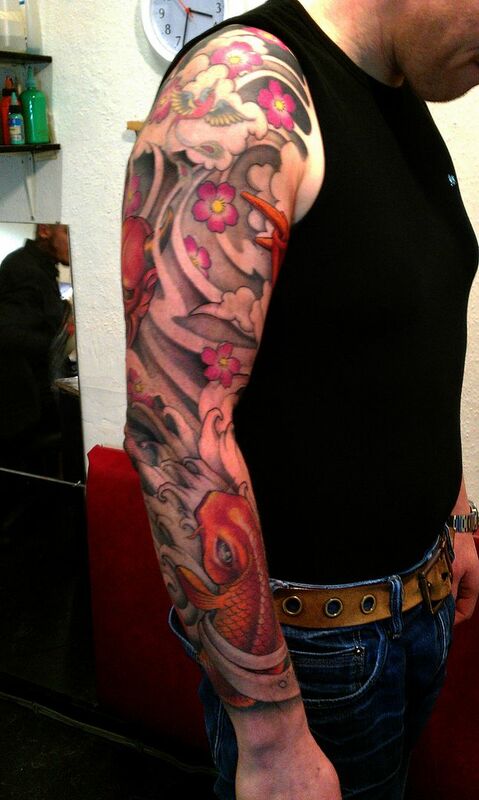 here’s his sleeve and the man himself! 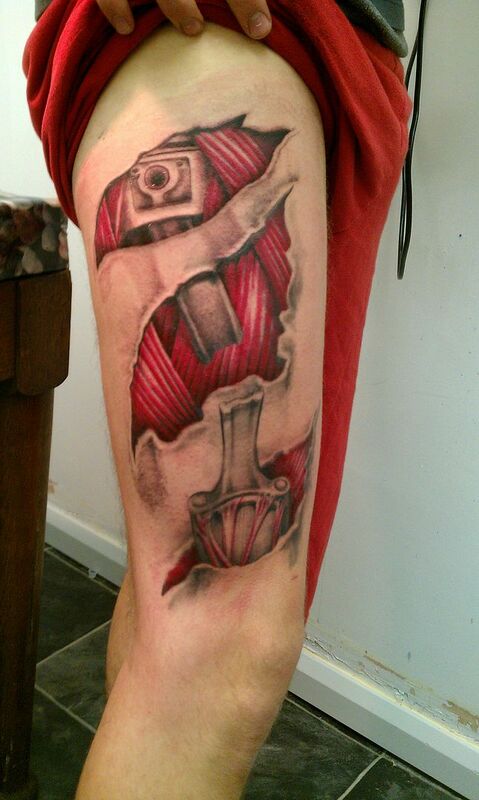 David number two is working on a piston in the skin piece, the broken piston shaft represents the struggle with- and his love of- fixing up old car engines. 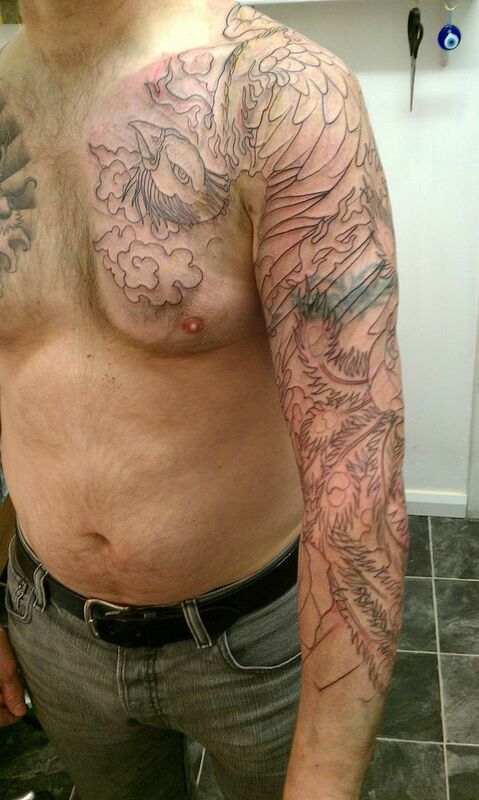 mark hadnt been in for a while, he had to cancel a couple of his appointments, but today we had some time, and we finished the background shading. 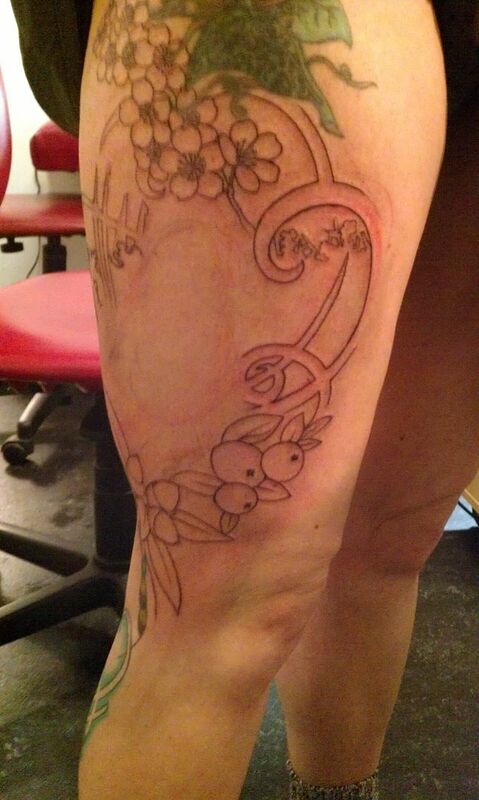 For now- I always like to add some bits to the shading at a later stage. 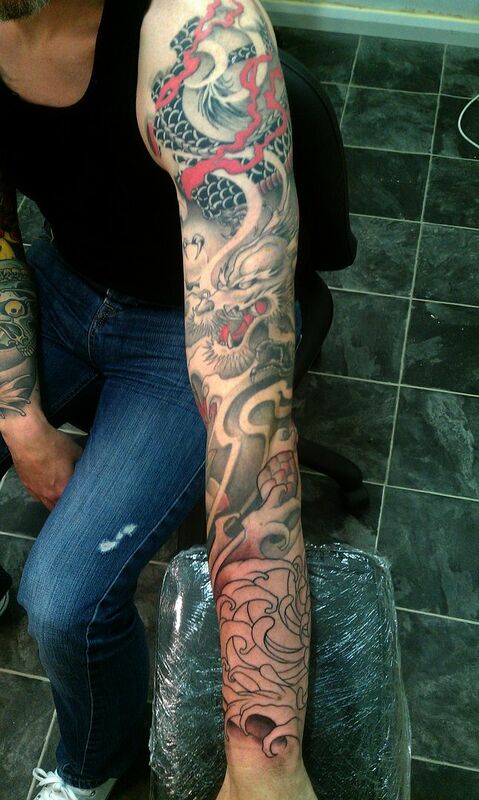 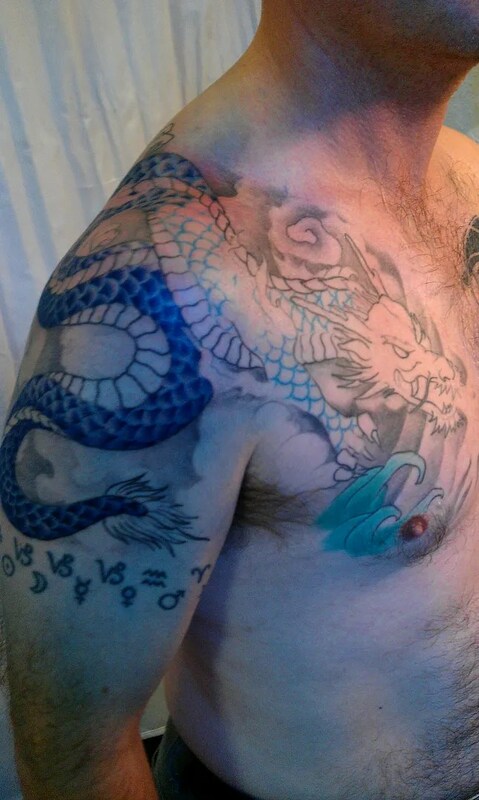 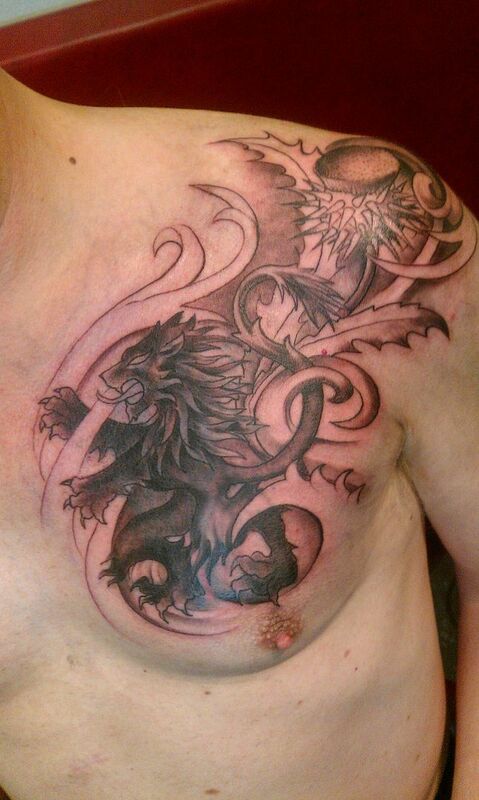 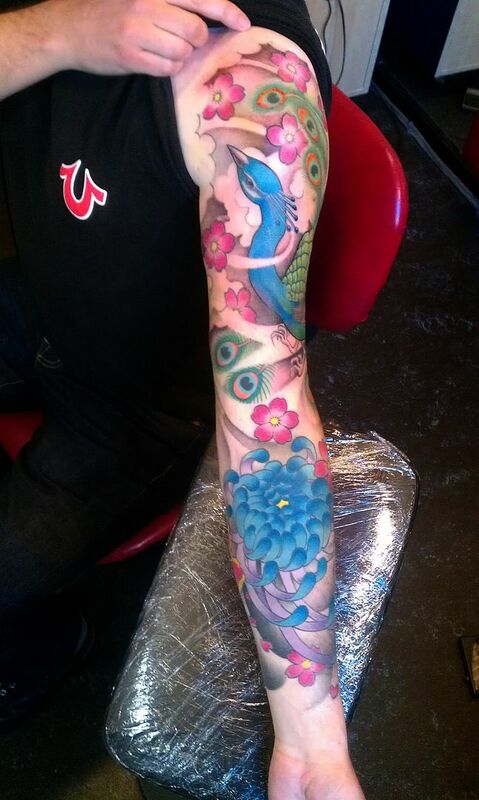 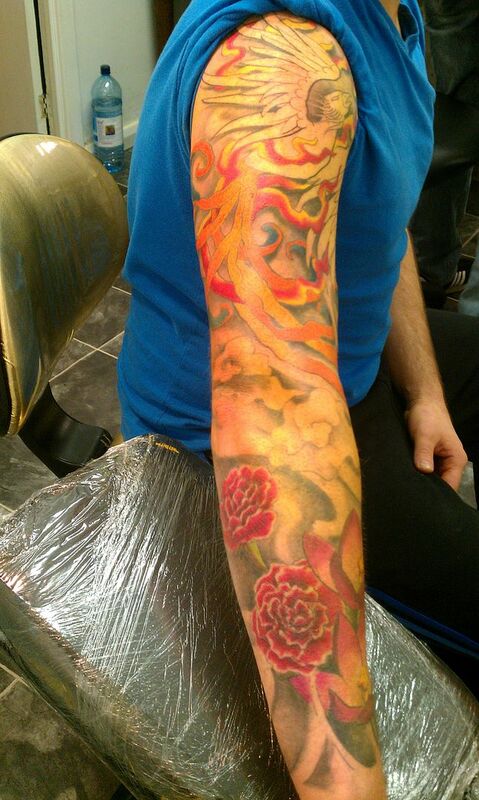 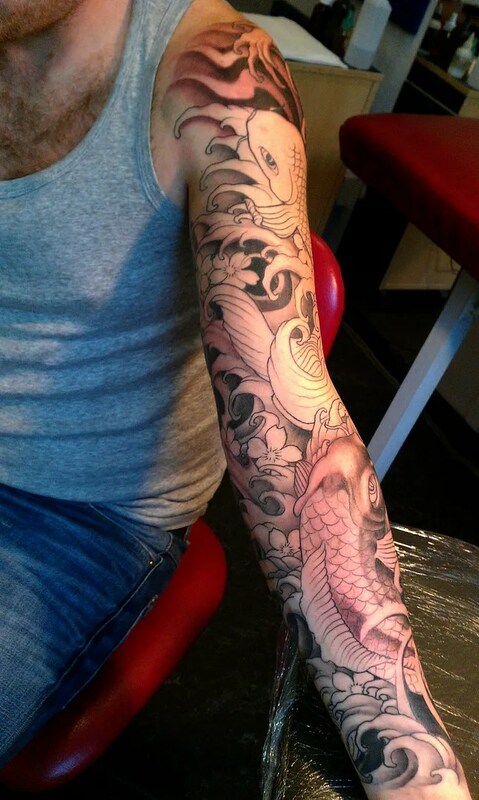 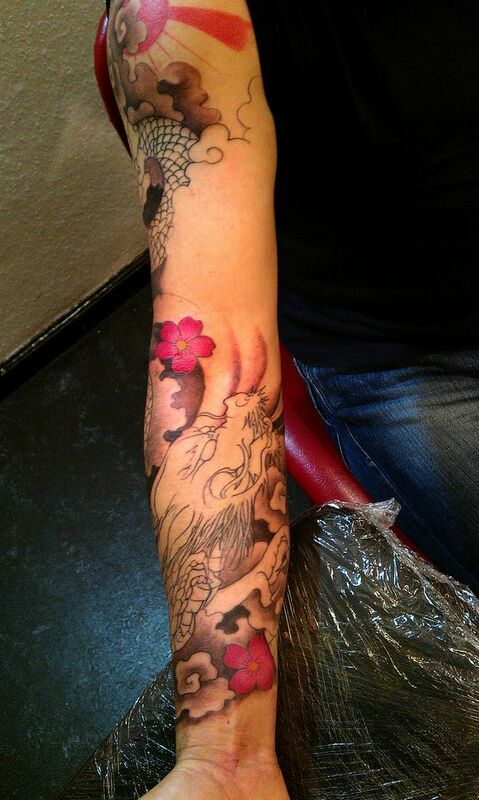 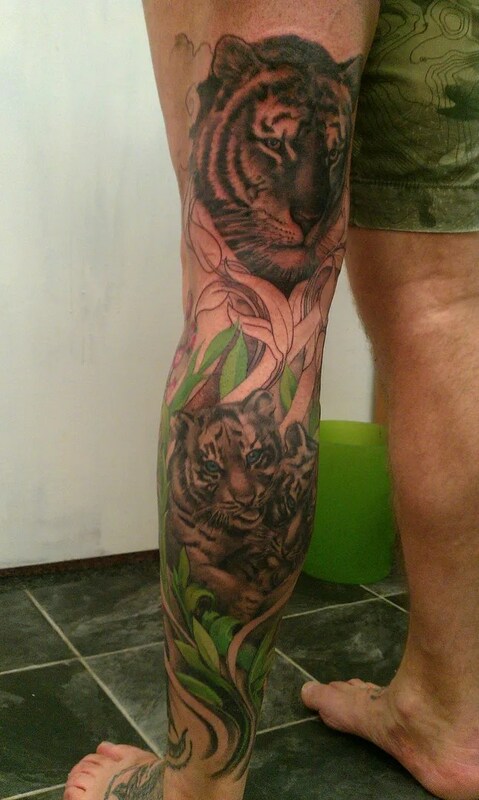 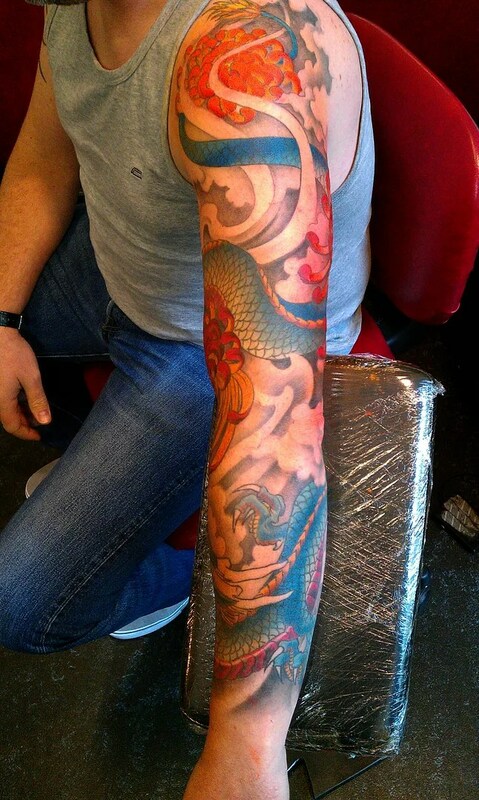 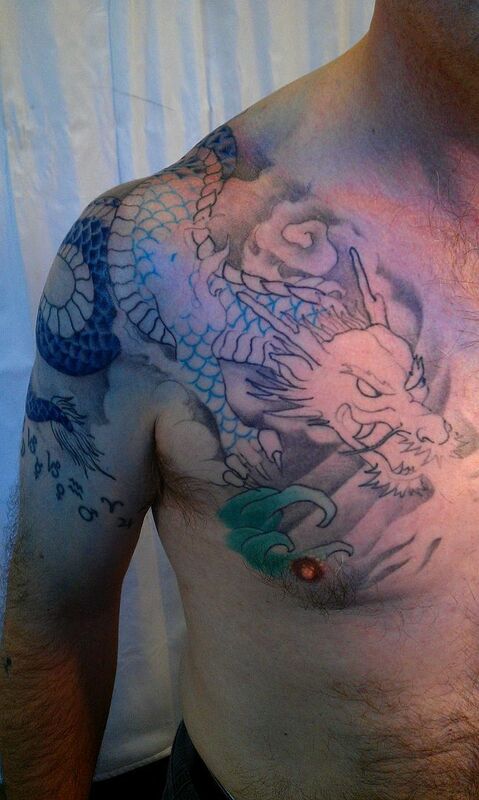 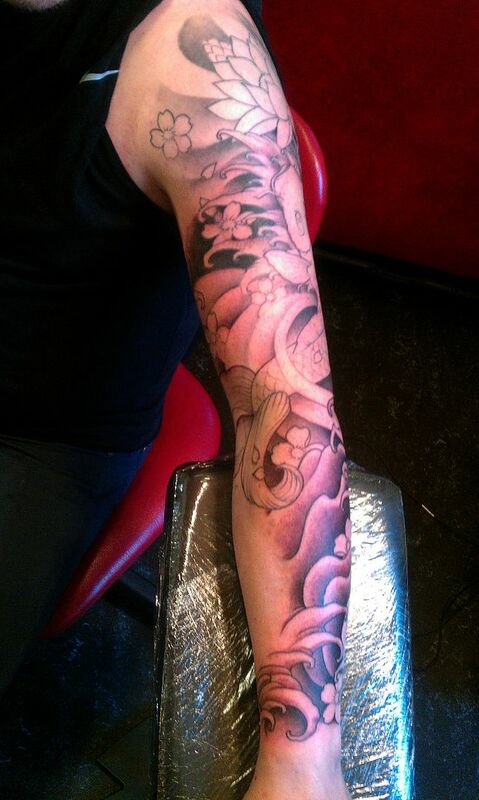 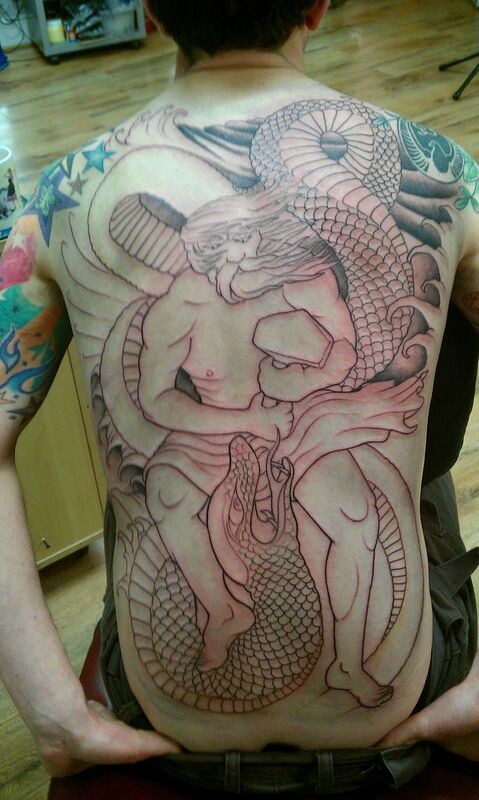 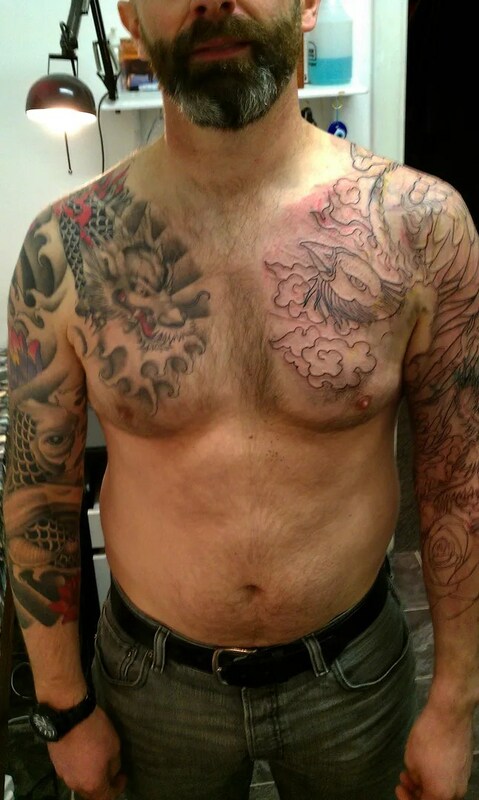 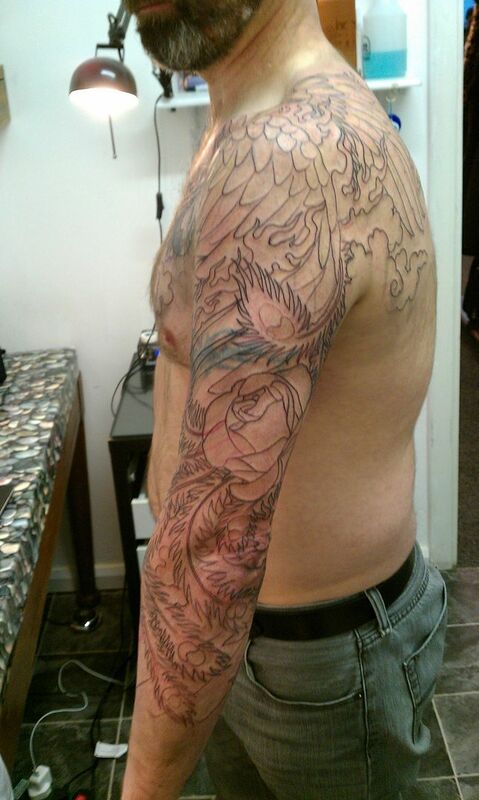 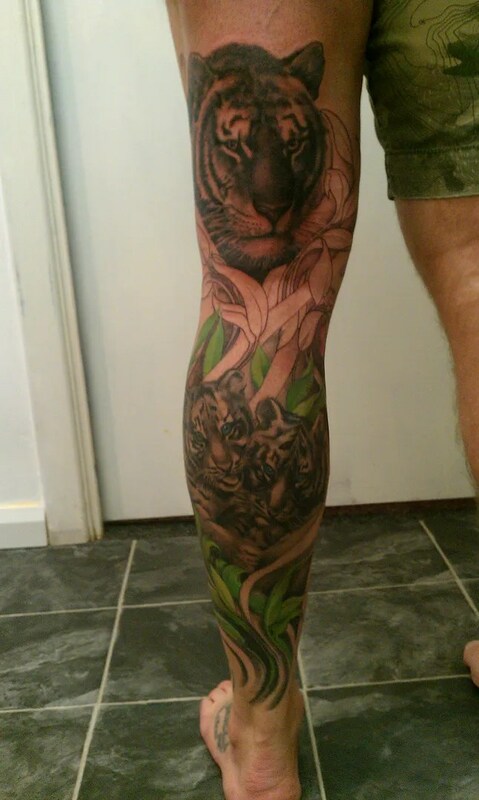 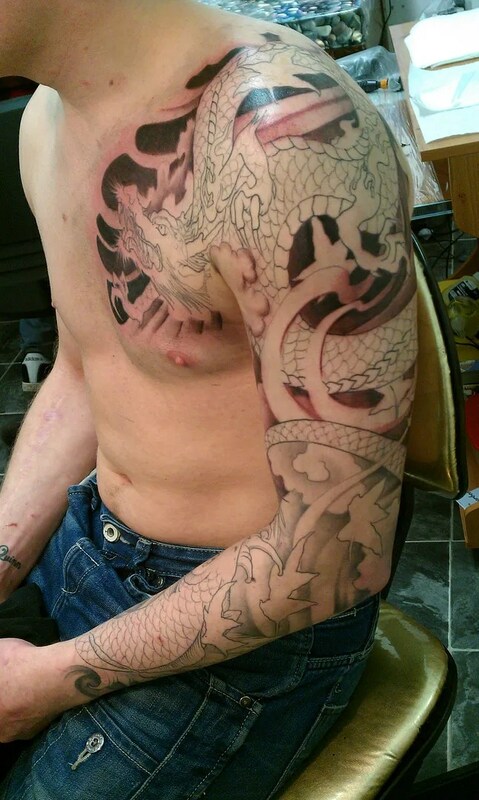 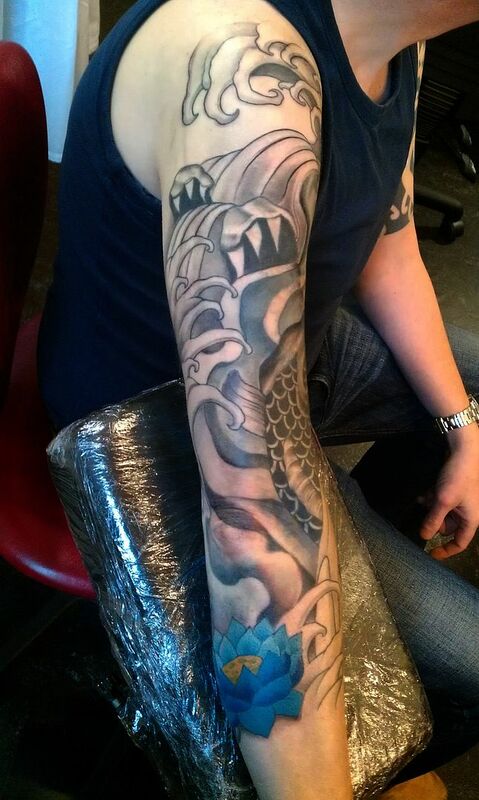 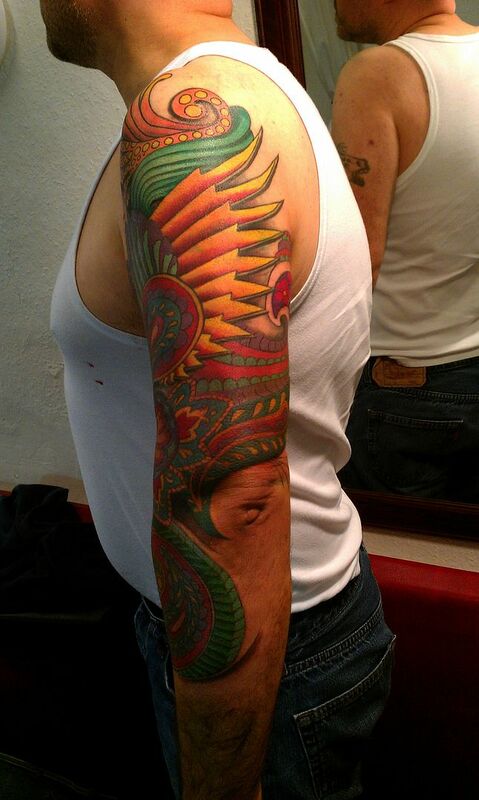 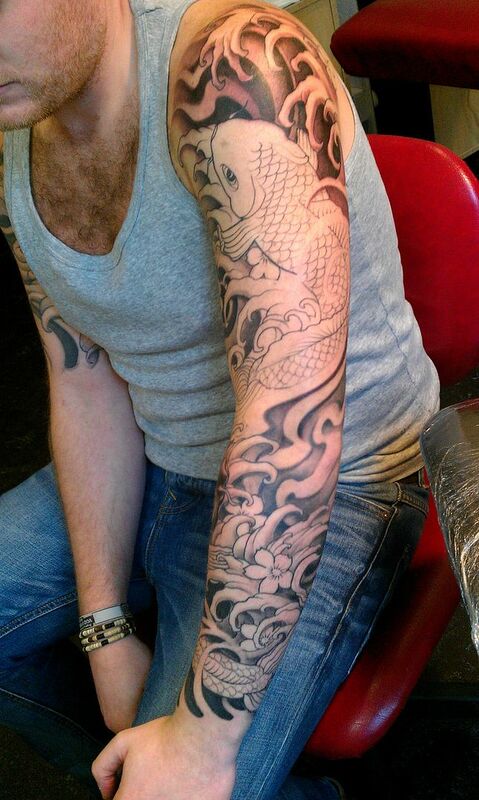 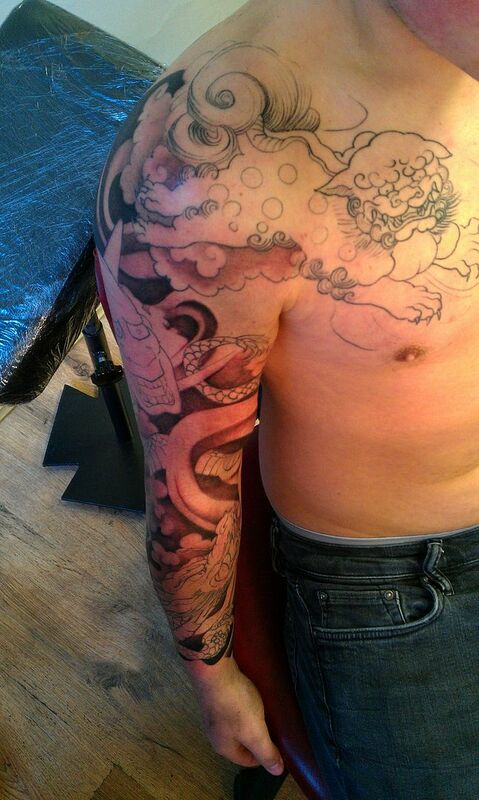 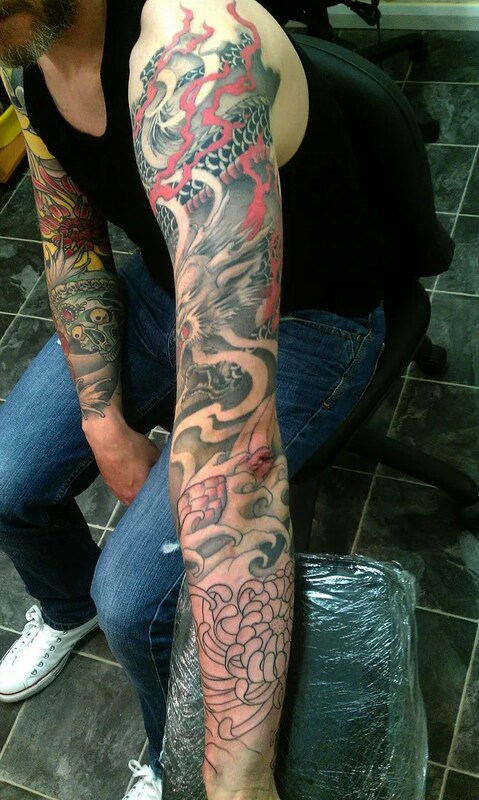 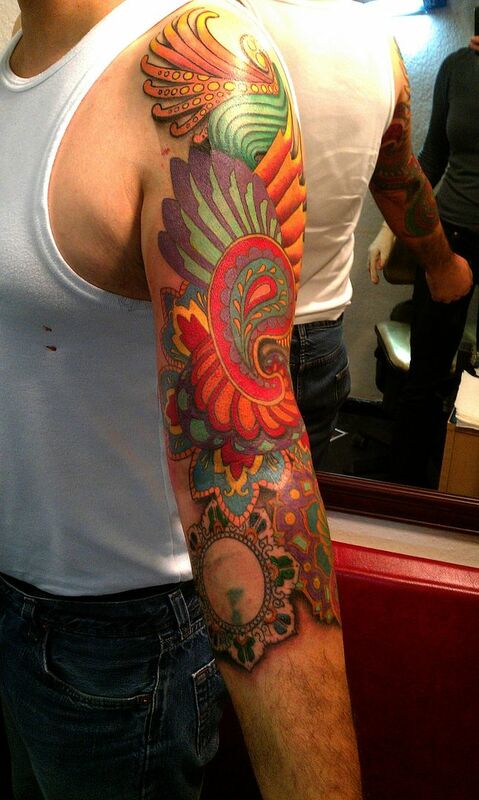 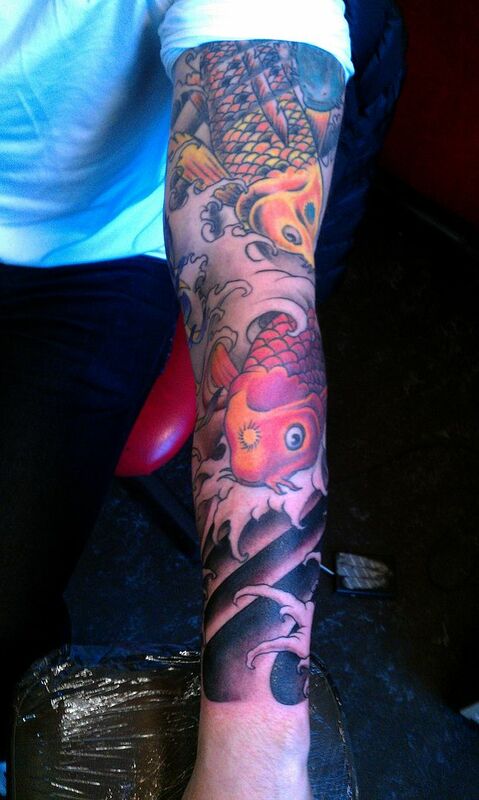 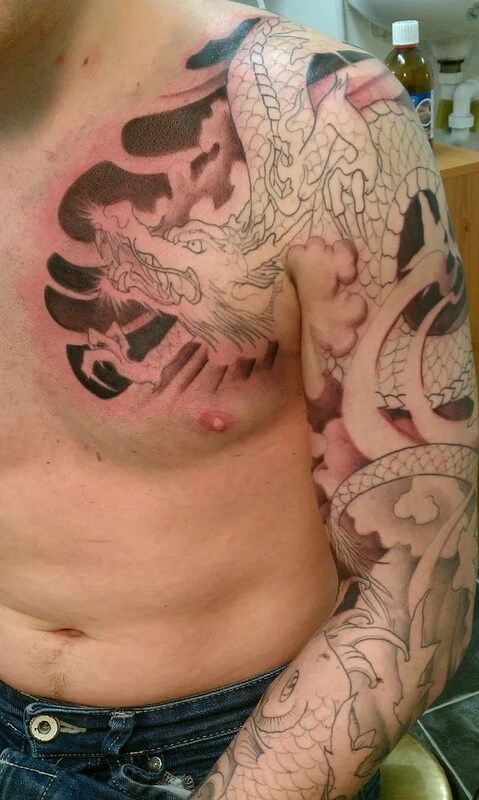 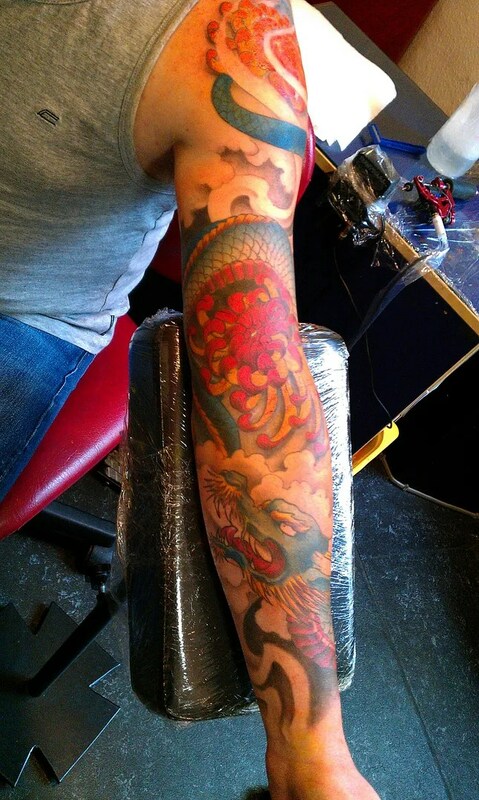 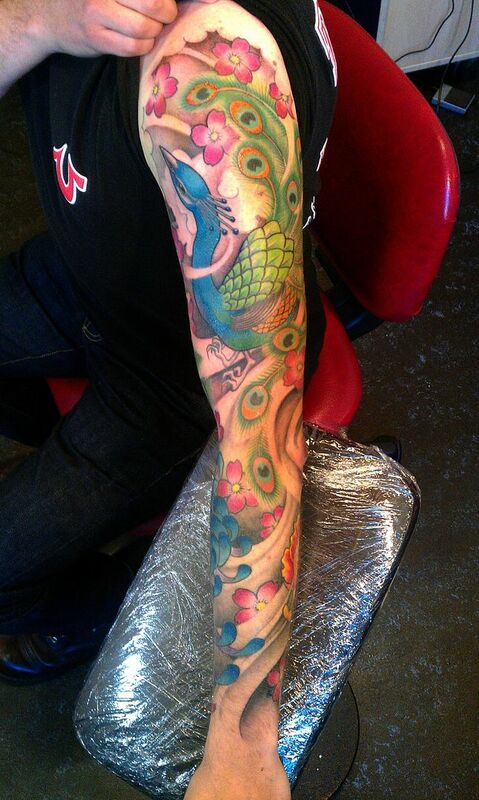 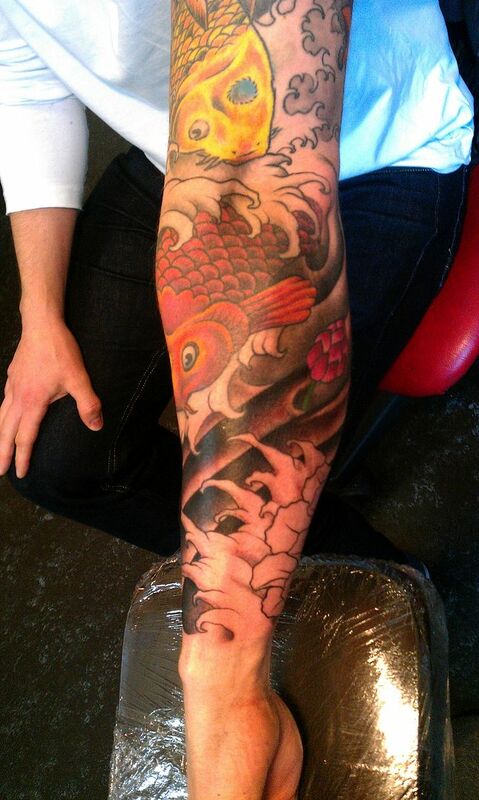 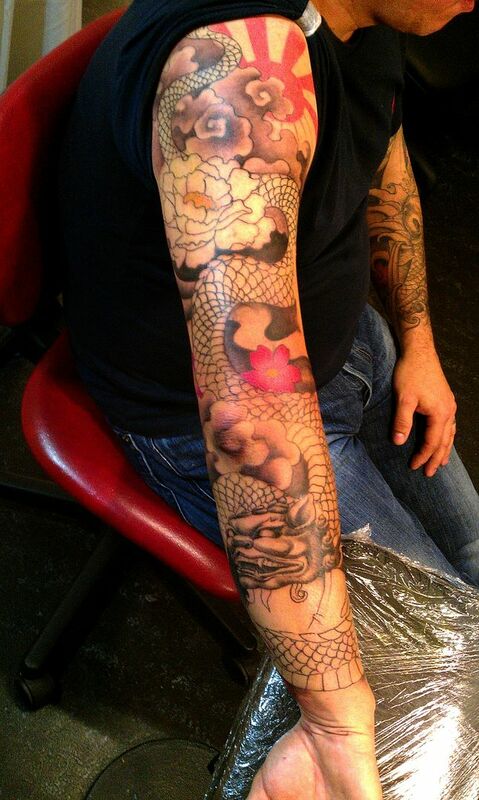 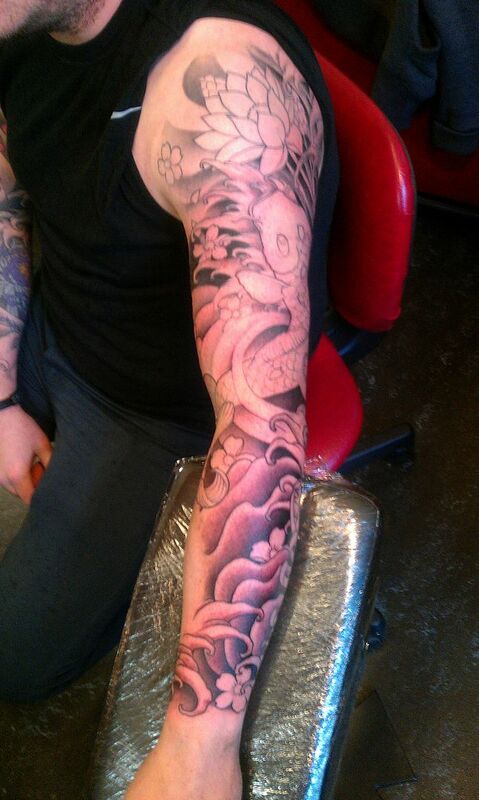 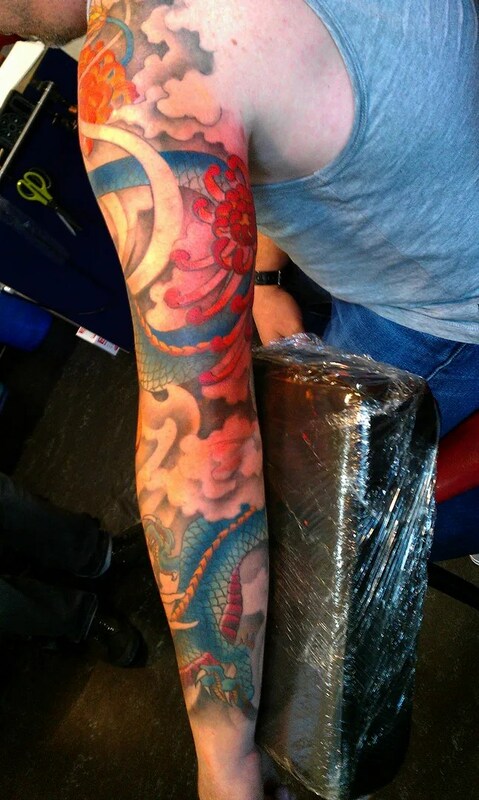 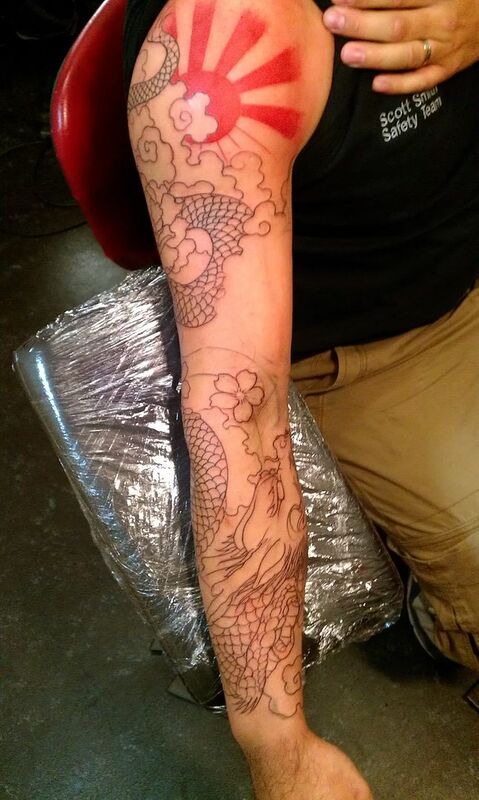 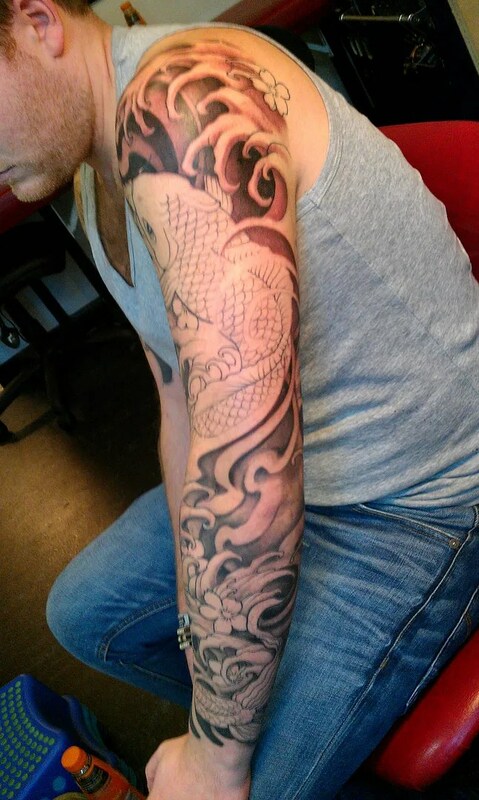 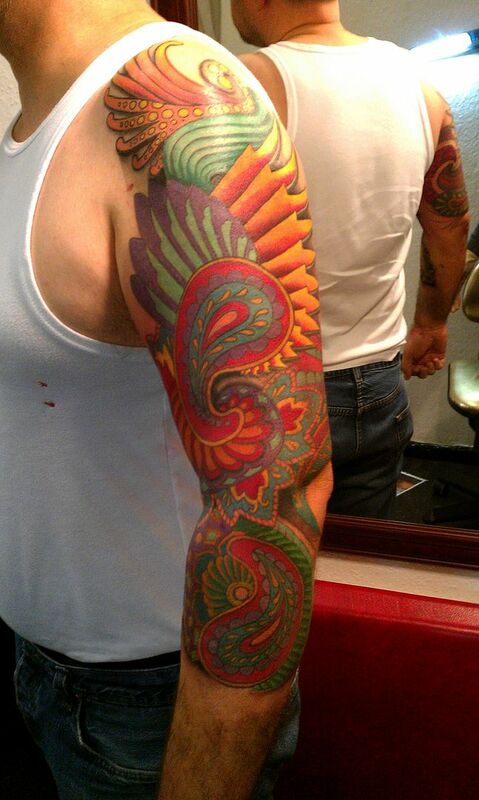 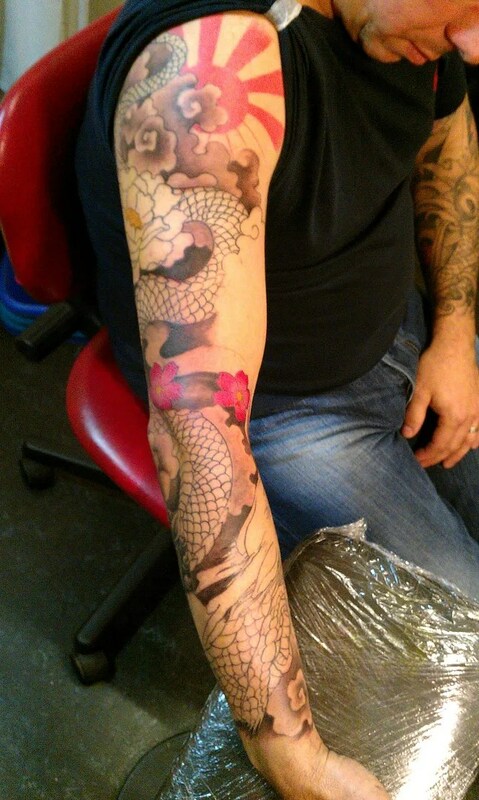 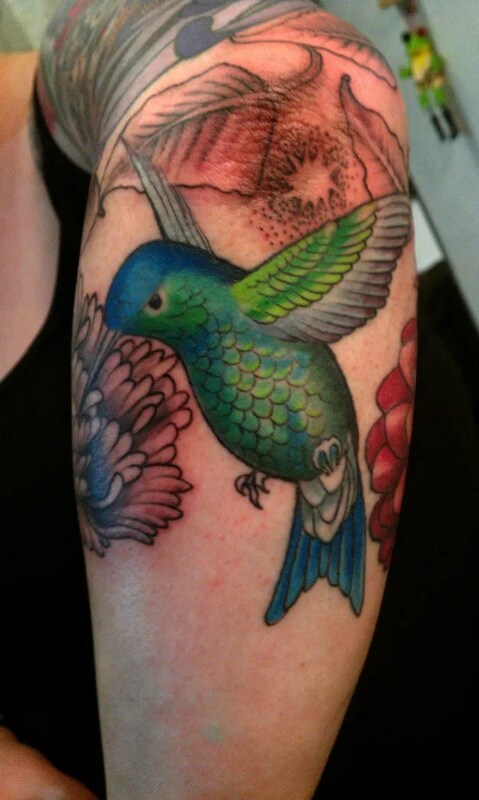 and steven had a couple of hours to add some colour to his phoenix. 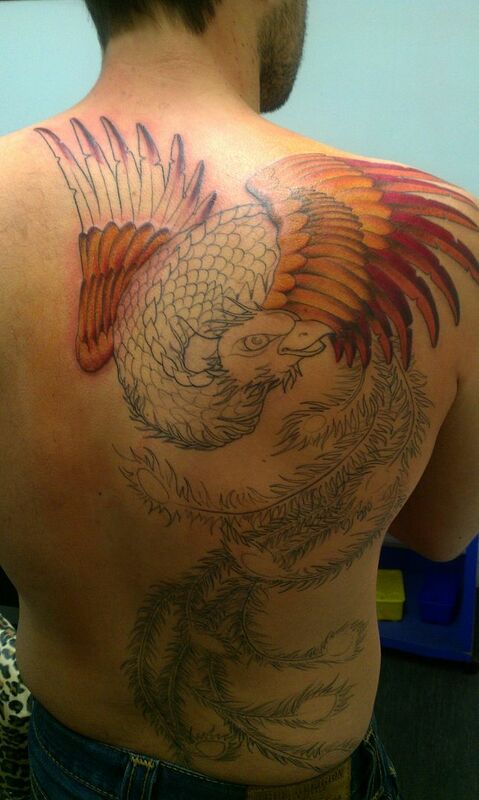 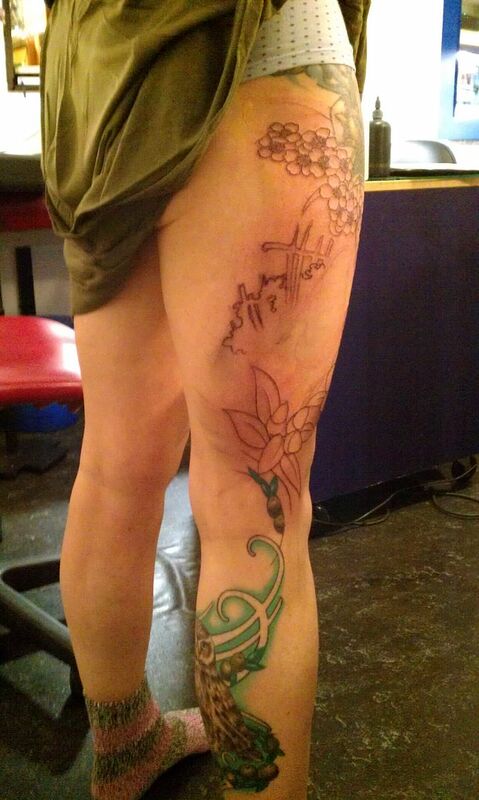 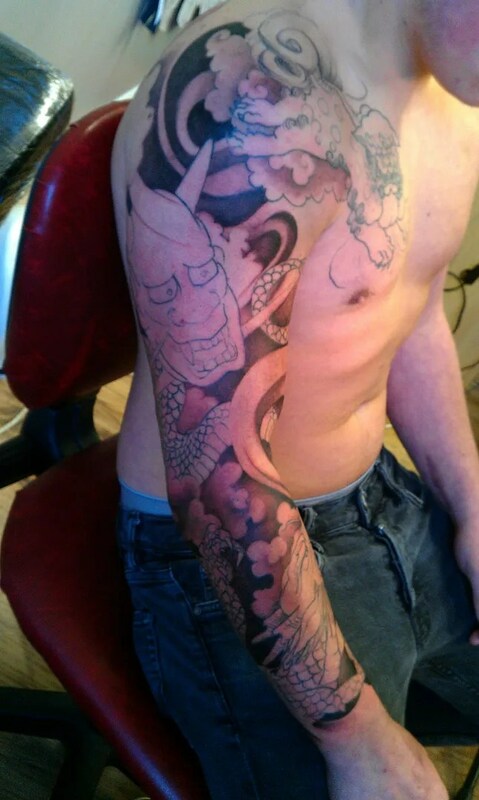 there will be more detailling in the tail feathers and the geisha. 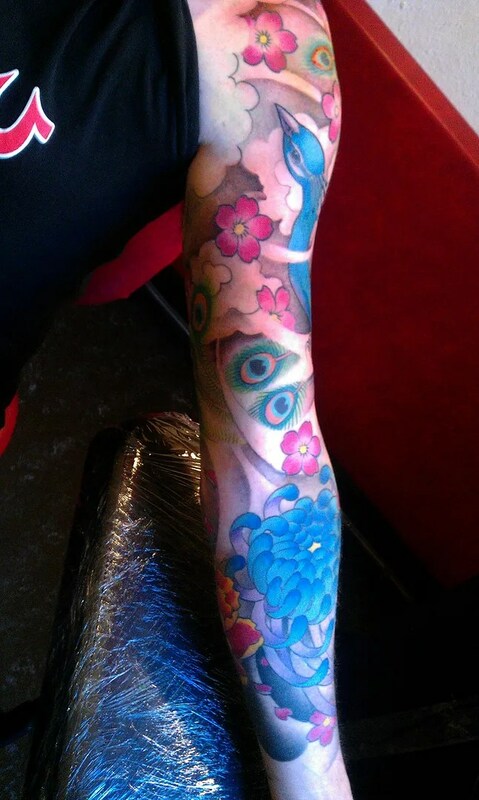 Ian has been working on his cover up sleeve, today we added the colour to the flowers and tidied up a bit here and there, tada! 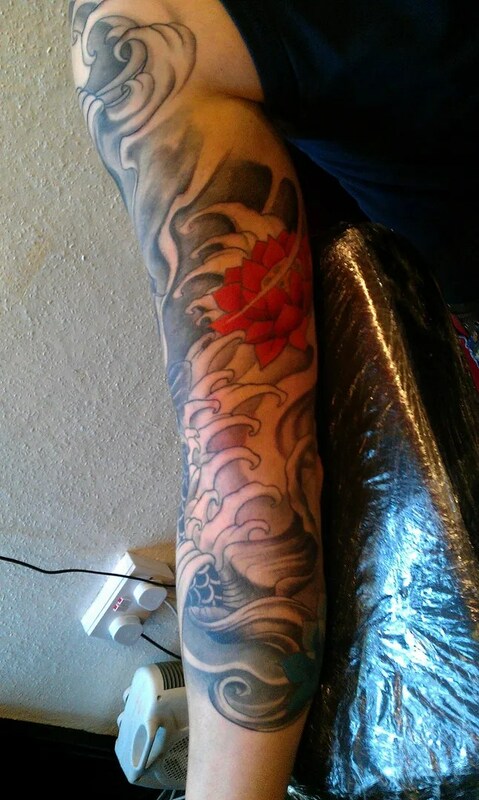 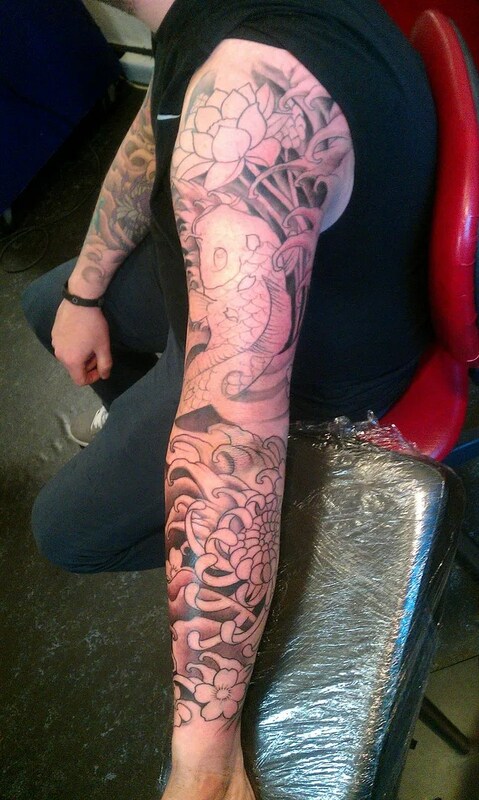 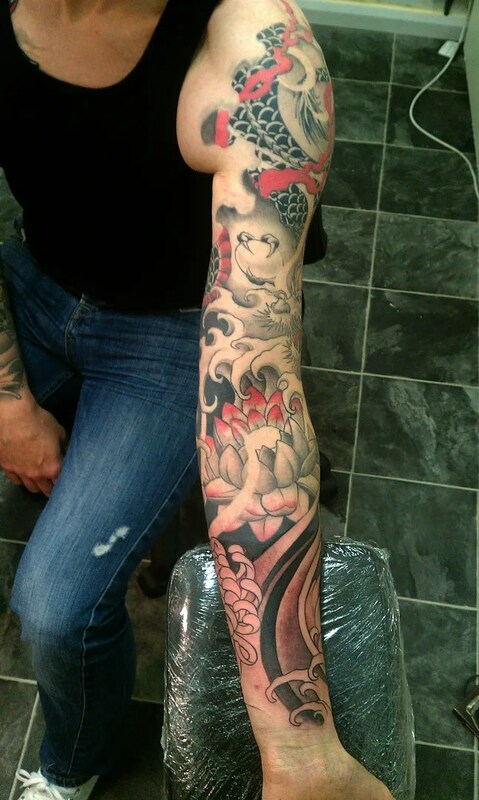 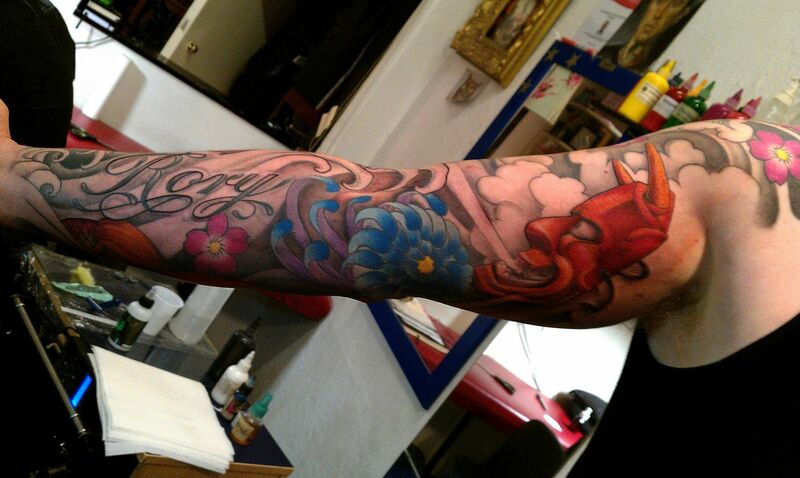 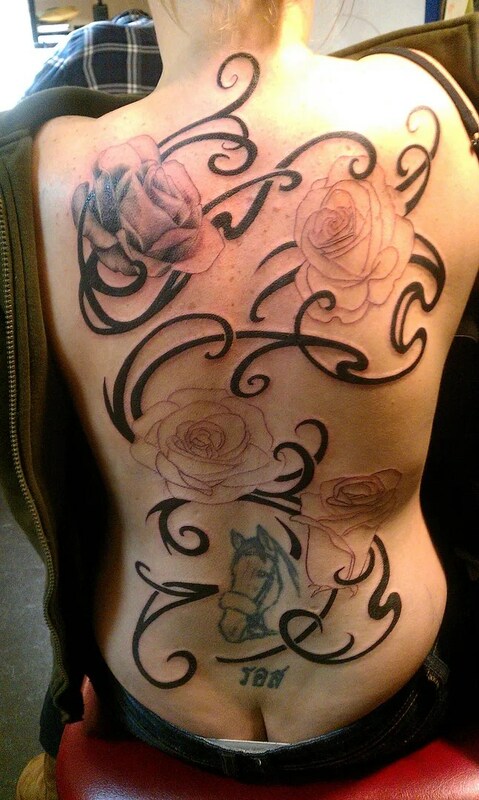 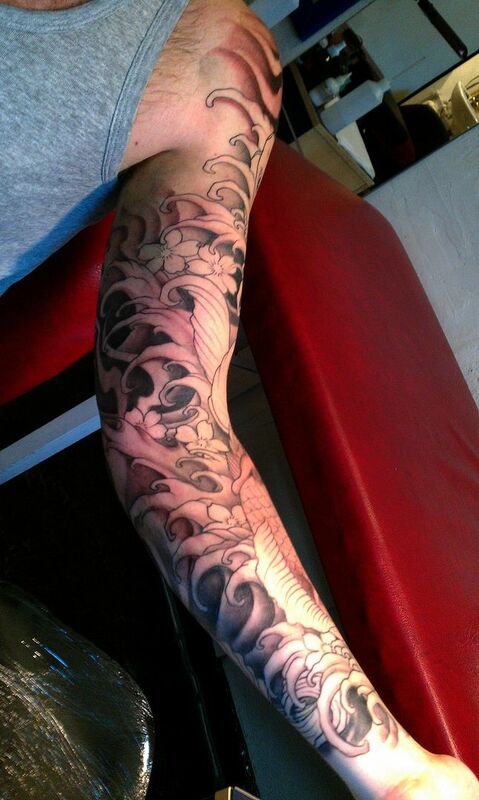 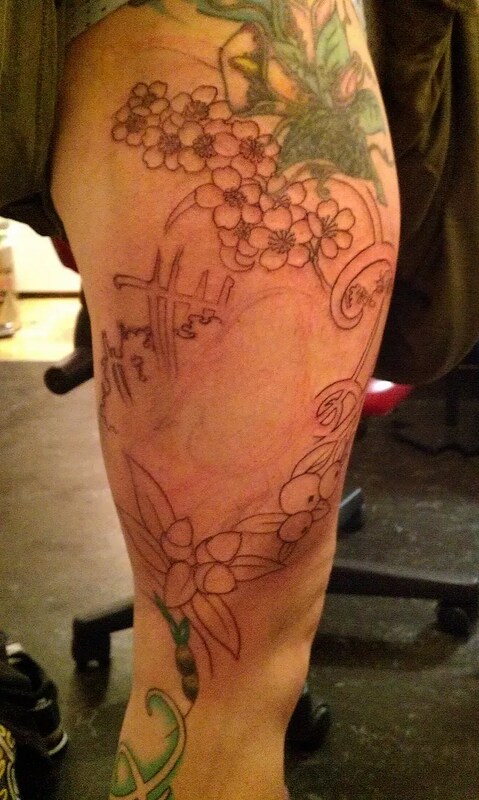 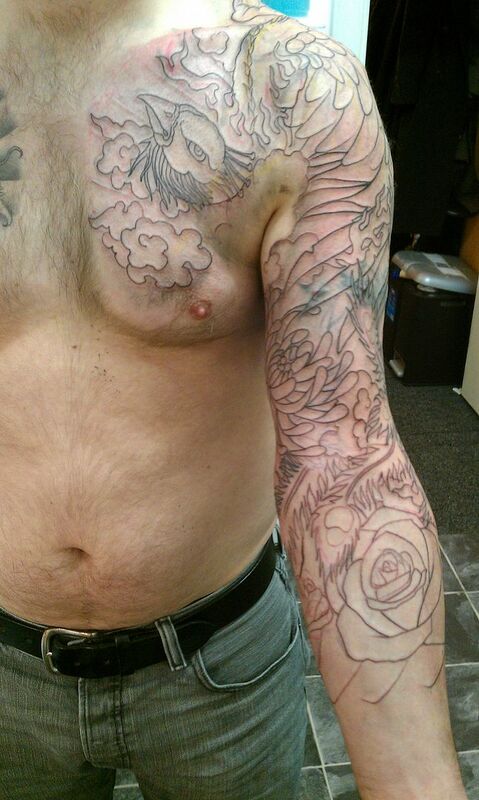 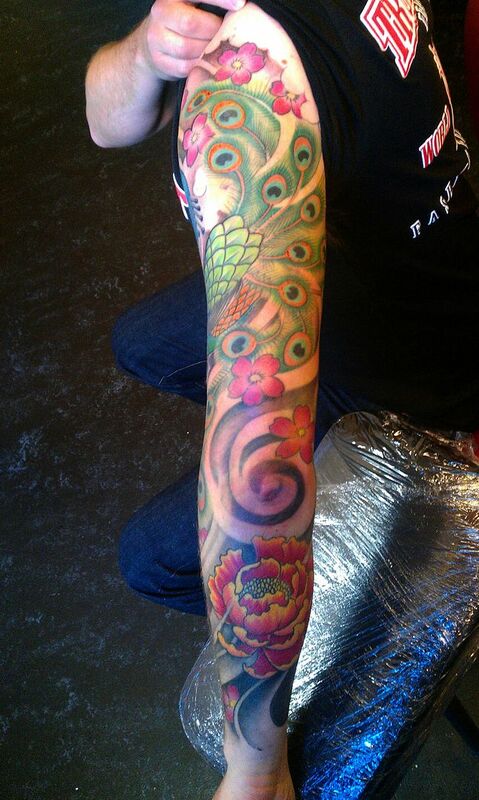 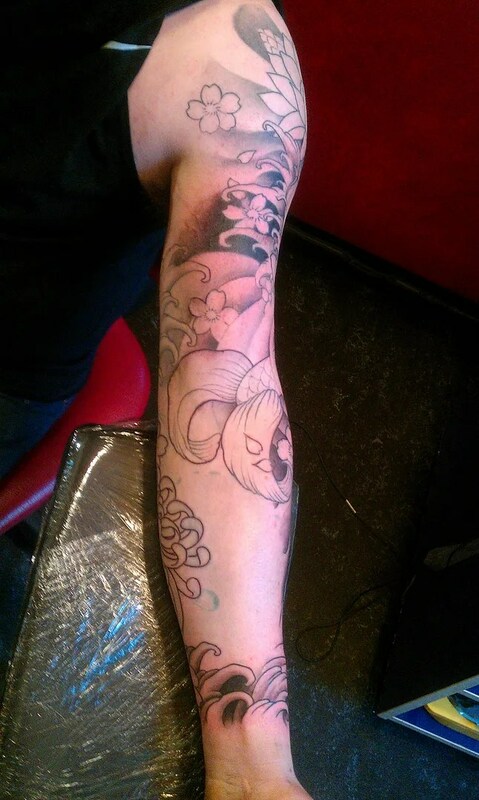 Back at work on friday I added some flowers and water to Brian’s half sleeve to make it into a full sleeve. 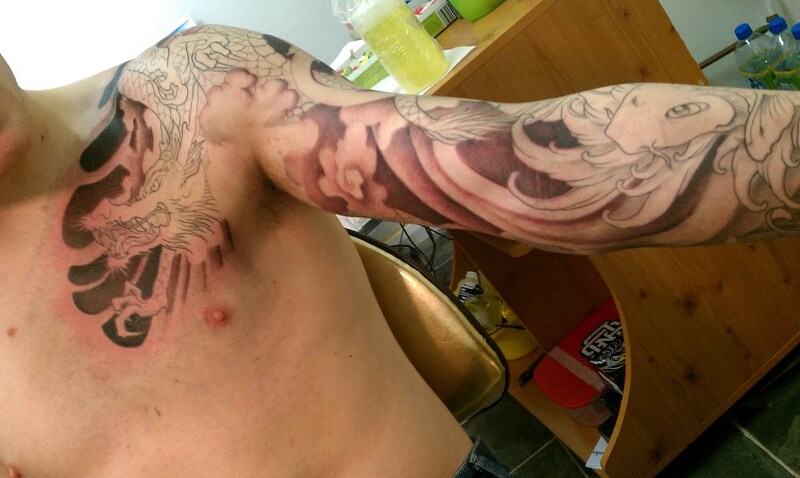 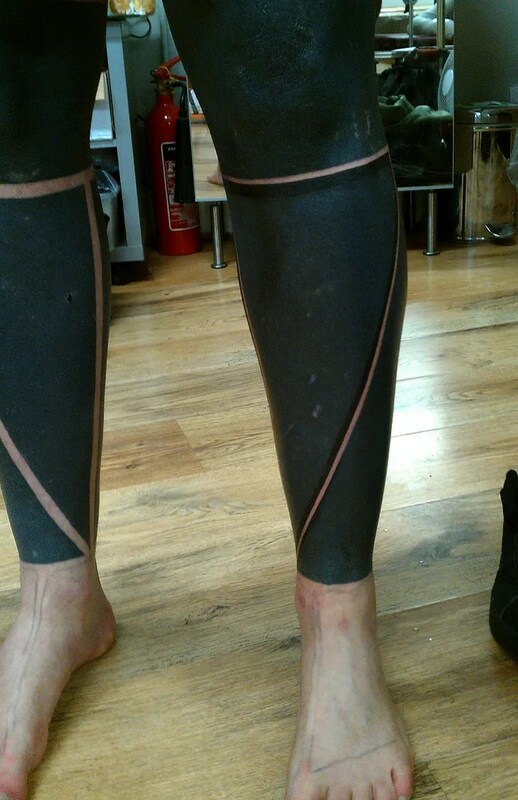 We also left a gap where we will put a mask of some description, once we have decided on which one. 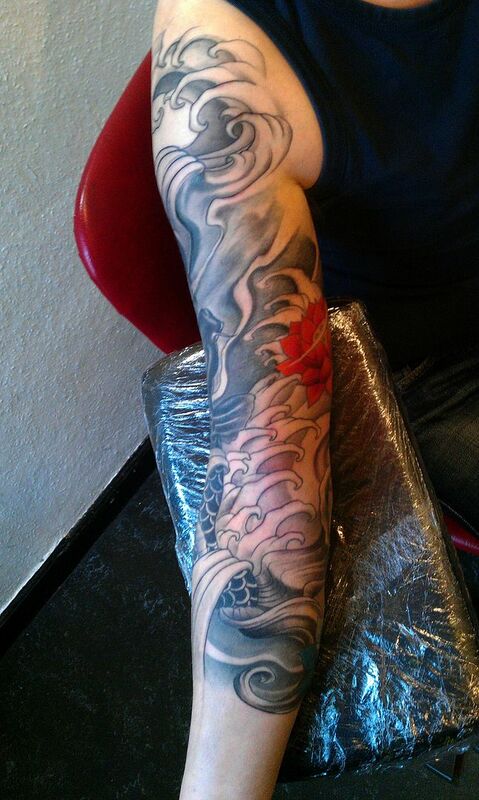 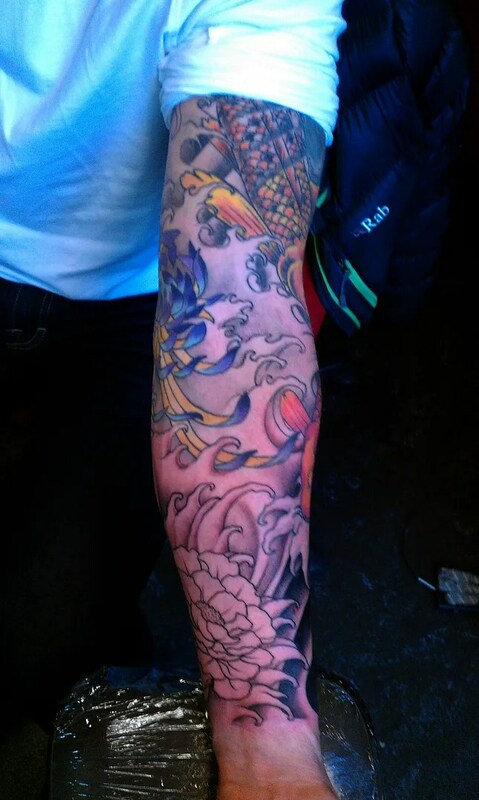 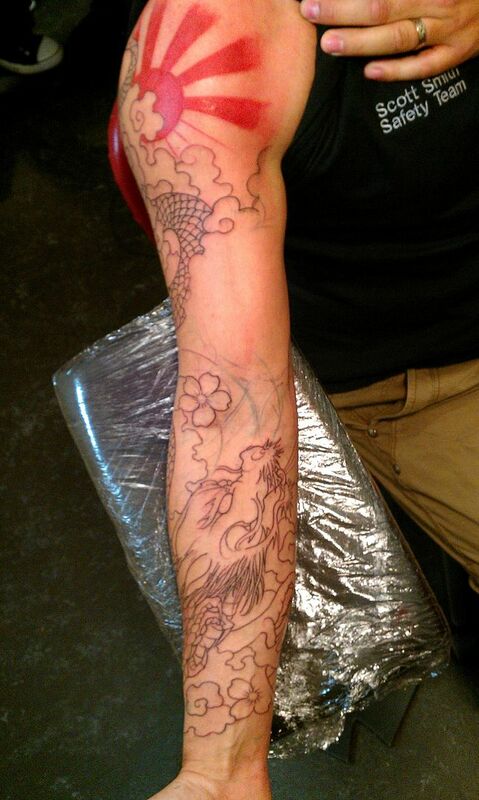 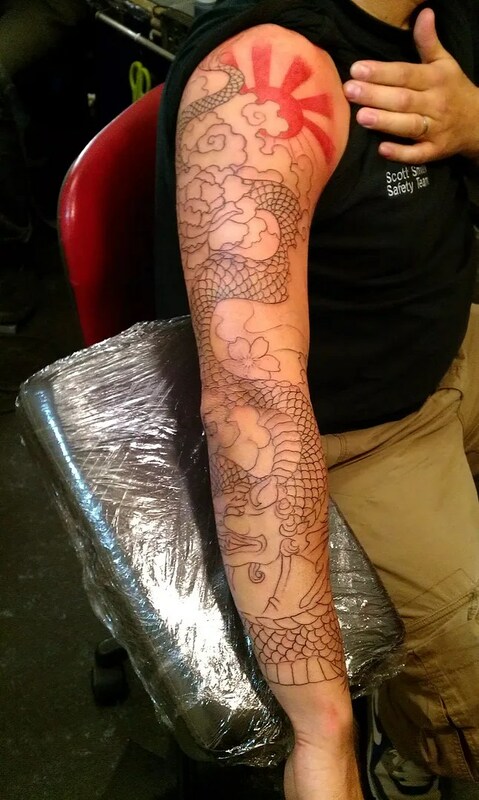 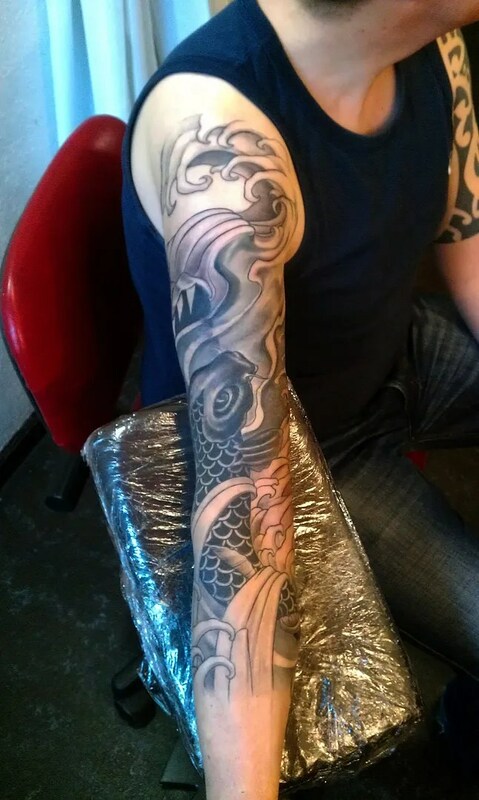 Last time Brian was in, he said he only wanted a half sleeve, even though he has a full sleeve on his other arm. 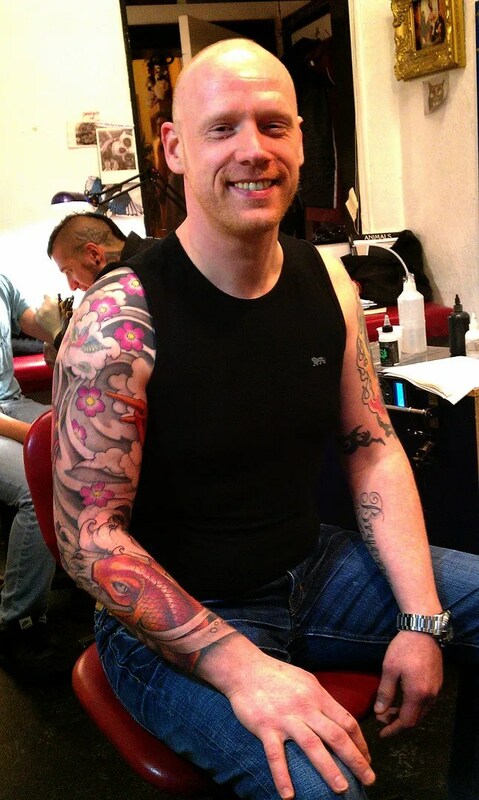 I distinctly remember rolling big comedy eyes and telling him he will only want me to extend it at some point, because who wants a full sleeve and a half sleeve? 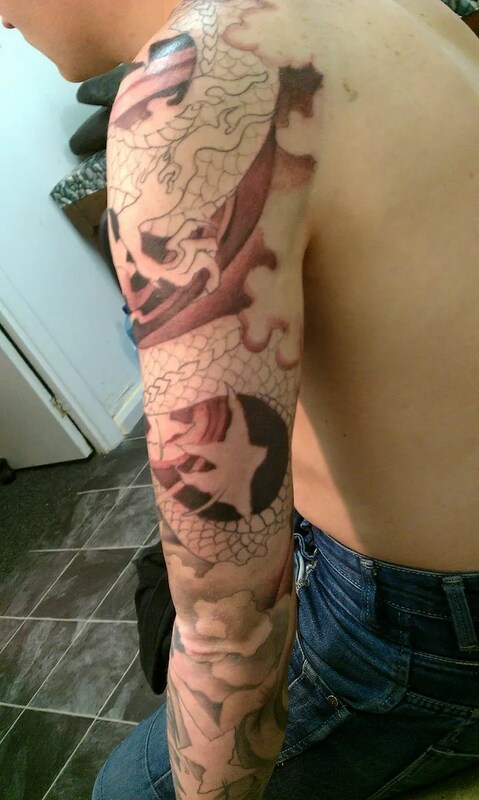 Billy had been getting an old grim reaper tattoo lasered by Roz, and now the black had faded to the point where we could cover the old piece more easily. 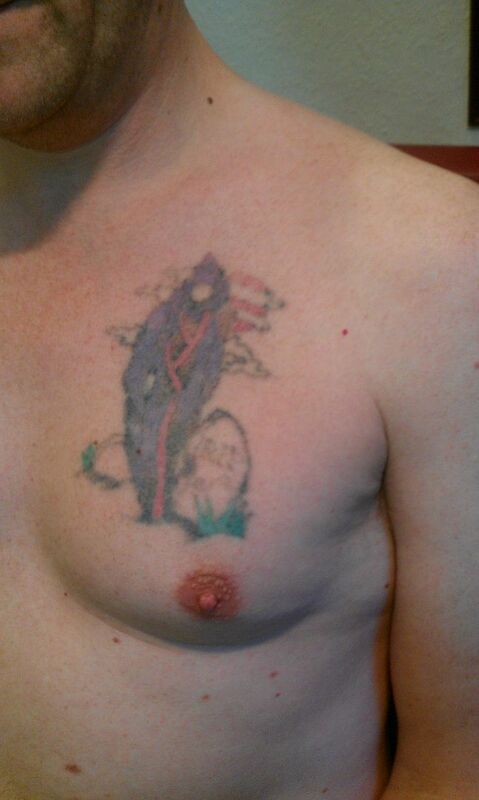 The green and purple are not affected by the laser unfortunately, but without the black outline they are easier to cover. 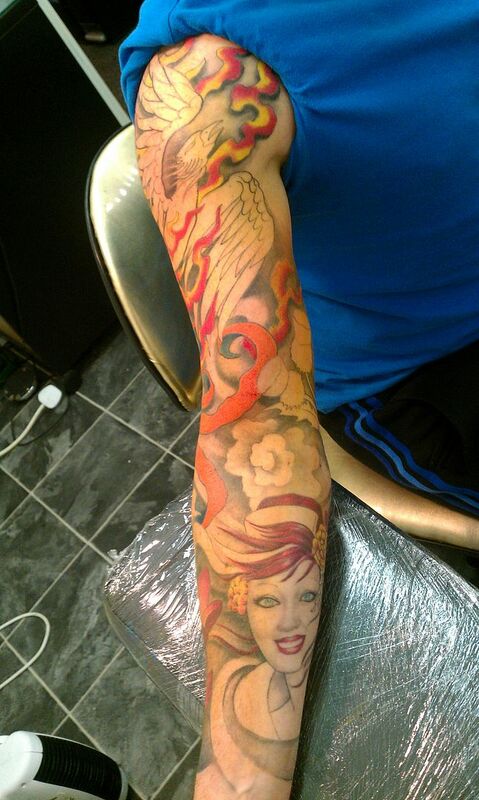 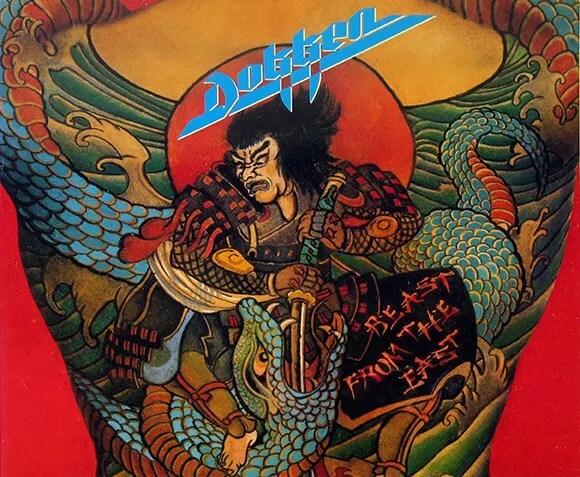 Roddi loves japanese images, and he also loves 90’s metal album art, and he has a wonderfully silly sense of humour. 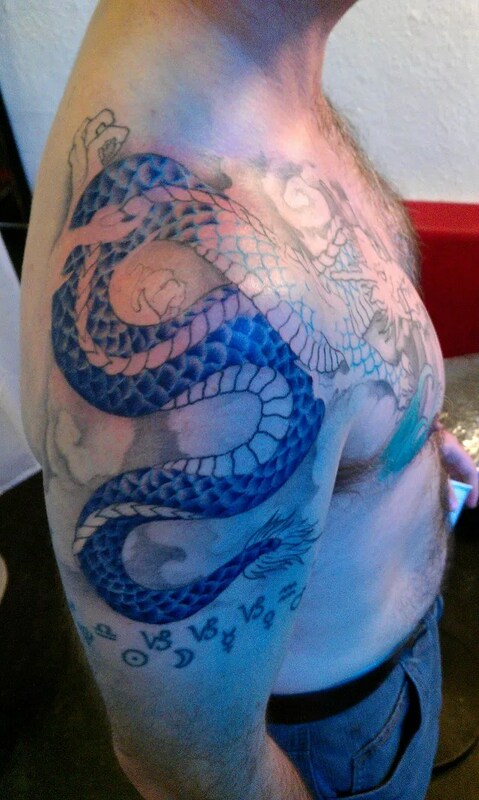 This piece is based on an album cover, the snake is very similar, but instead of the original japanese warrior we have thor in this piece. 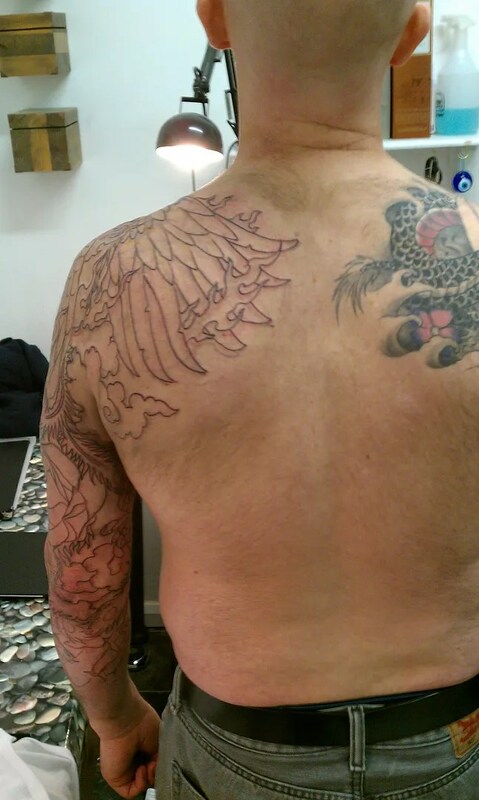 I had one of those ‘odd coincidence’ days, where both my customers were getting half back pieces of a phoenix. 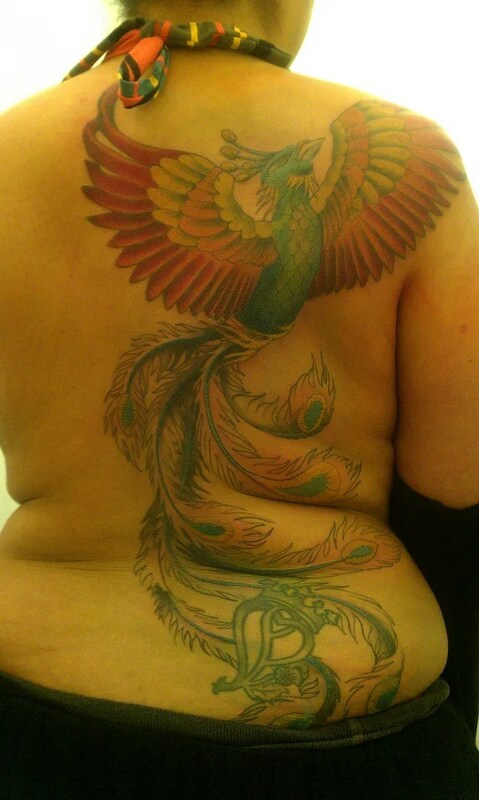 And both wanted their phoenix in more muted, autumnal colours – mad!